Tongue thrusting, simply defined, is the habit of placing the tongue in the wrong position during swallowing, either too far forward or to the sides. It is estimated that every 24 hours, you swallow a total of 1,200 to 2,000 times, with about four pounds of pressure per swallow. This constant pressure of the tongue will force the teeth and arches out of alignment. Aside from the pressure exerted while swallowing, nervous thrusting also pushes the tongue against the teeth while it is at rest. This is an involuntary, subconscious habit that is difficult to correct. Mouth breathing, which can cause the tongue’s posture to be very low in the mouth. Nasal congestion, allergies, or obstructions may contribute to this. Anterior open bite — This is the most typical and common form of tongue thrust. In such cases, the lips do not close properly, and a child often has an open mouth and tongue protruding beyond the lips. Generally, this type of tongue thrust is accompanied by a large tongue. Anterior thrust — The lower lip pulls in the lower incisors and the upper incisors are extremely protruded. The anterior thrust is frequently accompanied by a strong muscle of the chin (mentalis). Unilateral thrust — The bite is typically open on either side. Bilateral thrust — Posterior teeth from the first bicuspid through back molars can be open on both sides and the anterior bite is closed. The bilateral thrust is the most difficult to correct. Bilateral anterior open bite — The only teeth that touch are the molars. The bite is completely open on both sides, including the front teeth. A large tongue is often noted. Closed bite thrust — Both the upper and lower teeth are spread apart and flared out. The closed-bite thrust is typically a double protrusion. Is tongue thrust very prevalent? The term “tongue thrust” has been described and discussed in speech and dental publications since 1958 by many writers. The fact that a significant number of school-age children have tongue thrust has been noted by specialists. For example, recent literature reports that as many as 67 to 95 percent of five- to eight-year-old children exhibit a tongue thrust that may be associated with, or contribute to, an orthodontic or speech problem. In the United States, 20 to 80 percent of orthodontic patients exhibit some form of tongue thrust. The force of the tongue against the teeth is an important factor in contributing to malformation (“bad bites”). Many orthodontists have had the discouraging experience of completing dental treatment with great results, only to discover that the patient had a tongue thrust swallowing pattern. This continual habit will push the teeth out of alignment and reverse the orthodontic work. Is speech affected by tongue thrusting? Speech is not frequently affected by the tongue-thrust swallowing pattern. The “S” sound (lisping) is the one most affected. The lateral lisp (air forced on the side of the tongue rather than forward) shows dramatic improvement when the tongue thrust is also corrected. However, one problem is not always associated with the other. At what age does a child usually exhibit a tongue-thrust swallowing pattern? A child exhibits a tongue-thrust pattern from birth, because it is an infantile swallowing pattern. It is acceptable to have this swallowing pattern up to the age of four. Most children will outgrow the infantile pattern and develop the mature pattern of swallowing; in other words, they will not develop a problematic tongue thrust. If the child has not naturally outgrown the pattern by age four, the thrust is strengthened, becomes an issue, and will require a training program to correct the thrusting pattern. The most difficult problem of all is the diagnosis. As a rule, orthodontists, general dentists, pedodontists, some pediatricians, and speech therapists detect the problem. In many cases, tongue thrust may not be detected until the child is under orthodontic care. However, diagnosis usually is made when the child displays a dental or speech problem that needs correction. What Is the probability of correction? With sincere commitment and cooperation of the child and parent, and if there is no neuromuscular involvement, correction is possible in most cases. At the present time, successful correction of tongue thrust appears in 75% of treated cases, 20% of patients are unsuccessful due to poor cooperation and lack of commitment by parents and patients, and the remaining 5% are unsuccessful due to other factors that make correction impossible, such as physical or mental development problems. 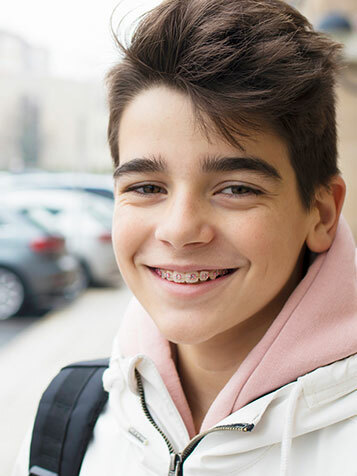 Tongue thrusting is the reason for misalignment and bite problems in nearly half of orthodontic patients. Tongue therapy is usually completed during orthodontic treatment. Correction by MyoFunctional Therapy or Tongue Therapy, which is an exercise technique that re-educates the tongue muscles. It is similar to “physical therapy” for the tongue, which is taught by a trained therapist. There are in-office visits and home exercises. The length of therapy is based upon the patient’s cooperation and dedication. Therapy has proven to give the highest percentage of favorable results. An appliance that is placed in the mouth by the dentist or orthodontist, which is generally not very successful. It is simply a punishment for the tongue instead of retraining. Call (619) 461-4310 to schedule your free consultation!